Kids aren’t little adults. Pediatric sepsis and septic shock usually presents as ‘cold shock’ where as adult septic shock usually presents as ‘warm shock’, for example. In this episode, a continuation of our discussion on Fever from with Ottawa PEM experts, Sarah Reid and Gina Neto, we discuss the pearls and pitfalls in the recognition and management of pediatric sepsis and septic shock. We review the subtle clinical findings that will help you pick up septic shock before it’s too late as well as key maneuvers and algorithms to stabilize these patients. We cover tips for using IO in children, induction agents of choice, timing of intubation, ionotropes of choice, the indications for steroids in septic shock, and much more….. Cite this podcast as: Helman, A, Reid, S, Neto, G. Recognition and Management of Pediatric Sepsis and Septic Shock. Emergency Medicine Cases. August, 2014. https://emergencymedicinecases.com/episode-50-recognition-management-pediatric-sepsis-septic-shock/. Accessed [date]. Be very cautious in setting of tachycardia and DO NOT WAIT for hypotension to make diagnosis of septic shock. A pediatric patient with hypotension and sepsis is a pre-arrest patient. Blood work should include CBC, electrolytes, glucose, kidney function, blood gas, blood cultures, LFTs, and lactate. Urine cultures are commonly done to identify a possible source. Clinical history guides imaging such as chest x-ray. Up to 25% of children with septic shock will have adrenal insufficiency, so always check glucose in septic children. Extremes in blood glucose in sepsis are associated with higher mortality in children (2). Arterial lactate 2 times upper limit of normal indicates organ dysfunction. 1) Circulation, 2) Airway, 3) Breathing. Establishing IV access in a septic child can be very difficult, especially in the setting of hypotension. 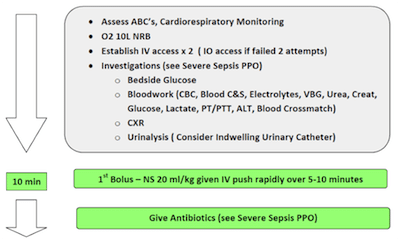 If, after 1MINUITE of trying, you cannot establish IV access, move to IO (ideally x2). Blood pressure should not be a deciding factor in giving fluids. All septic patients should receive the initial boluses. When to intubate in Pediatric Sepsis and Septic Shock? Consider early intubation in fluid refractory septic shock (after 3 boluses of 20ml/kg IV NS) or in any compromised airway. Infants or neonates with severe sepsis may require early intubation. Intubation and mechanical ventilation increases intrathoracic pressure which reduce venous return and lead to worsening shock. Therefore, fluid resuscitation must be done first. There is no strong data supporting any particular induction agents or paralytic agents in the intubation of a septic child. Ketamine Drug of choice as it is relatively safe in hypotension and tachycardia. However, catecholamine depletion can cause refractory hypotension and result in worsening shock. Propofol Should not be used for long-term sedation in children younger than 3 years old because of an association with fatal metabolic acidosis. Etomidate Should be discouraged or used carefully in septic shock as it inhibits the adrenal axis and sympathetic nervous system affecting hemodynamic stability. Etomidate is associated with increased mortality in children with meningococcal sepsis because of adrenal suppression effect. Succinylcholine 1 mg/kg (or 2mg/kg in infants) IV or Rocuronium 0.45-0.6 mg/kg IV are both reasonable choices for paralytic agents. Warm Shock: Norepinephrine .05-0.3 mcg/kg/min and titrate to effect. Corticosteroids: The use of hydrocortisone in pediatric septic shock is currently being investigated and its role is unclear. Consider using hydrocortisone 2mg/kg in any child that has fluid and inotropic resistant septic shock or proven adrenal insufficiency (1). Normalization of vital signs is a main goal. Aim for a normal blood pressure, pulse (without differences between central and peripheral pulses). Clinically, the child should have a normal capillary refill, warm extremities and urine output >1ml/kg/hour indicating improved perfusion. Lactate and mental status should be normalized as well. ESTABLISHED PROTOCOLS for pediatric sepsis have been shown to DECREASE MORTALITY. (5)(2) It is helpful to have your room equipped with PALS algorithms (6), broslow tapes, GCS and normal vital sign tables to facilitate timely and accurate decisions. See below for The Children’s Hospital of Eastern Ontario pediatric sepsis algorithm. If all else fails, ECMO can be used in the child who is in cardio-respiratory failure and refractory to all treatment. (2) However, in Canada, this treatment is almost exclusive to the ICU setting given all the resources involved. Hypotension is a late sign – do not wait for it to diagnose and aggressively treat pediatric sepsis. CAB, not ABCs – fluid 20ml/kg is the first priority even if normal BP. Aim for three boluses over the first hour. Don’t delay using an IO! Don’t forget glucose –a large proportion of septic children have adrenal insufficiency, which is associated with increased mortality. Question 1: What are the risk factors for sepsis and poor outcomes related to sepsis? Answer: A history of recent surgery, neuromuscular disease, respiratory or cardiac desease or immunocompromised state should all increase your suspicion for sepsis in a child presenting to the ED with fever. Infants under 1 month of age are especially high risk, and early adolescents are also at risk. Question 2: What are the main differences in septic shock between adults and children? Answer: Hypotension is almost universal in adults, where as unexplained tachycardia without hypotension signifies septic shock in children. Hypotension is a late sign of septic shock in children. Whereas adults usually present in ‘warm shock’, children usually present in ‘cold shock’. Finally, the incidence of adrenal insufficiency in septic shock is much higher than in adults, and so hypoglycemia should be assessed and treated early in the management of children in septic shock, and consideration of steroid therapy should be given in fluid refractory shock. Question 3: What are cardinal symptoms and signs of early sepsis that we need to know in order to suspect the diagnosis early in the clinical course? Answer: In addition to signs of poor perfusion (prolonged capillary refill, lethargy and irritability), a sometimes overlooked clue to the presence of septic shock is tachycardia that is out of proportion to fever (HR increases by about 10bpm and RR by 5 breaths/min for every Celsius degree elevation of temperature above 38). Question 4: Infants and neonates with severe sepsis may require early intubation, but when we intubate and mechanically ventilate we increase intrathoracic pressure which can reduce venous return and lead to worsening shock. How should we prevent this from occurring? Answer: Aggressive fluid administration (60ml/kg NS) before attempts at intubation, unless a respiratory arrest is imminent. The priorities of management in septic shock is CAB (Circulation, Airway, Breathing) rather than ABC. Question 5: What is the induction agent of choice in the child suffering from septic shock? Answer: Ketamine, although not supported by any vigorous data, is usually the drug of choice as it is relatively safe in patients with hypotension. Propofol is associated with fatal metabolic acidosis in children. Question 6: What are your goals of resuscitation in the child in septic shock? Answer: The goals of resuscitation in pediatric septic shock are the normalization of vital signs, normal mental status, normal capillary refill, warm extremities, a urine output of >1ml/kg/hr and a normal lactate. 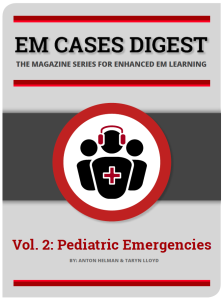 For more EM Cases content on Paediatric Emergencies visit EM Cases Digest Vol. 2 Pediatric Emergencies here. Dr. Helman, Dr. Neto and Dr. Reid have no conflicts of interest to declare. In the Key Take Home Points, I think it should be ceftriaxone 100 mg/kg (not 20 mg/kg). Thanks for the correction Thomas!